Blu-ray (or BD for short) is an optical disc format used for storing data and high-definition video. Data from BD can be read, recorded, or re-written depending on the disc type (BD-ROM, BD-R, BD-RE). Each disc can hold approximately 10x the storage of a DVD at 50GB, which is roughly 20 hours of audio and video! Blu-ray operates with high definition audio and 1080p high definition video. These high-density discs first appeared on the market in 2006 and were developed by industry leaders that make up the Blu-Ray Disc Association headed by Sony. Blu-ray was involved in a high definition optical disc format war with the HD DVD (High Definition Digital Versatile Disc). The HD DVD jumpstarted the high definition market as Blu-ray was initially more expensive and problematic. However, the tide significantly shifted in this format war when Sony decided to include a BD player in their wildly popular PlayStation 3 game console. Alliances between major players in the technology and entertainment industries moved format favor toward Blu-ray as well. Retailers quickly followed suit and the HD DVD developers conceded to Blu-ray in 2008. Blu-ray uses similar concepts to other optical media like CDs and DVDs in its engineering. They employ close to the same physical dimensions as a DVD. DVDs consist of two 0.6mm discs flanking a recordable data layer, while Blu-ray uses just one 1.2mm polycarbonate disc, therefore reducing manufacturing costs. The disc stores digitally encoded video and audio data in spiraled grooves on the polycarbonate layer. A driver’s laser follows these grooves to read microscopic indentations (called pits) which interpret the encoded information. 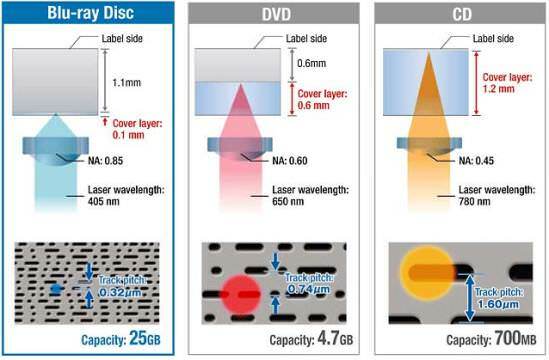 Compared to a DVD, the grooves are thinner and are packed at a higher density. Blu-ray has a transfer rate of 36Mbps compared to DVD’s 10Mbps. To fit more data within the same dimensions, the data layer is closer to the outer surface and laser. The layers of a DVD can be prone to laser beam distortion, whereas the Blu-ray recording layer’s proximity to the surface removes these readability issues. Each BD has a tough, clear polymer coat that contributes to its scratch resistant and durable shelf life. Blu-ray draws its name from the blue laser that’s required to read the disc. Blue lasers have a shorter wavelength at 405 nanometers than a DVD’s red laser at 650 nanometers. A smaller beam focuses on the pits in the grooves with higher accuracy and precision. The blue laser is also twice as thin as a DVD’s red laser. Blu-ray eliminated the “e” from its name for trademark purposes. Blu-ray discs will only operate on a Blu-ray player, drive, or a Sony PlayStation 3 game console. A BD drive has varying measures of backward compatibility with CDs and DVDs because certain specifications are not required and are up to each manufacturer. However, since DVD is still a popular medium, most BD devices are backwards compatible with them.